TO SIGN UP, PLEASE CONTACT JANET HILL - janet.hill@rocketmail.com or 218.259.4090. We are showered with TONS of lovely musicians again this year. This presents a blessing and a problem for us. The blessing is obvious! The problem is not so obvious, but is simply this: We may have trouble filling all the workshops with students. Two things need to happen: 1) everyone who took a workshop last year needs to return. 2) more people need to sign up. If you know of anyone who may be interested, please pass the word... think of any scheme you can to get the word out in your community! Thanks! It may be possible that some of the workshops won't be 'viable'... i.e., they won't have enough students to be worth the day's effort of the teacher. If this happens, you will either be asked to pick a second choice... OR, you could perhaps negotiate a private lesson with that teacher too. Janet will keep you informed. Exact workshop locations for each session have not been determined yet this year, but many will be at Don & Mary Anne Bennett's house or in that general vicinity, south of Nisswa on Long Lake or Round Lake. After you sign up you will be notified of the exact location of your workshop. The two dance workshops will be at the Nisswa Pioneer Village. *** All workshops are generally taught by ear and participants are encouraged to bring recording devices. 10 am to 3 pm – Beginning Swedish Fiddling with Hans Ehrling & Kalle Eriksson . . . These two fiddlers from Rättvik are veterans of Nisswa-stämman, having performed here in other years with Öj Pojkar and the Rättviks Spelmanslag. This year they are sponsored by the ASI Spelmanslag. They will conduct workshops for fiddlers who are at a more beginning level of fiddling and haven’t had much, or any, exposure to Swedish fiddle music. They will teach walking tunes (marches), waltzes and polskas from their home area. They will talk about rhythms in the music and give an overview of their music and how it fits into their everyday lives in Rättvik. They will provide sheet music and recordings of the tunes they teach, so participants can take the music home with them and continue to work on them. This is a great opportunity for beginning fiddlers! 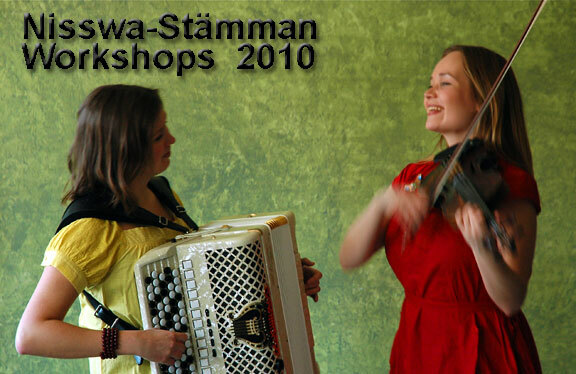 10 am to 3 pm – Finnish Fiddling and Folk Music Improvisation with Kukka Lehto of the Polka Chicks . . . Kukka started to play the violin at the tender age of three. She has studied at the Helsinki Pop & Jazz Conservatory and at the Sibelius Academy Folk Music Department, and is a musician at the National Theatre of Finland. She joined the Polka Chicks in 2004, and has toured with various bands in Europe, Russia, and the U.S. Kukka is known for her ability to play in a range of styles from bluegrass and folk to classical. In her workshop, she'll teach Finnish “pelimanni”-music on fiddle. Kukka also has a passion for folk music improvisation (and is very good at it! ), so she'll get you started improvising, too. 1 pm to 3 pm – Danish Fiddling with Peter Uhrbrand of FAERD . . . Peter will present traditional Danish folk/dance music based on "listen and play" -- by ear, motivation and a few years of instrumental training (not for beginners). Special focus in this workshop will be on the unique music and dance tradition from the village of Sønderho on Fanoe Island, Denmark. To learn the dance that goes with this music, be sure to sign up for the Sønderhoning dance workshop (see Dance Workshops)! 10 am to 3 pm – Tunes from Rogaland, Norway with Geitungen . . . Geitungen is a Norwegian trio that plays tunes once popular with party-goers in the hinterland of Rogaland county in Norway. The group consists of Vidar Skrede on hardanger fiddle, fiddle and guitars, Christer Rossebø on fiddle, mandolin, mandola and guitar, and Håvard Ims on button accordion. In this workshop, you'll get a close up meeting with the most outstanding young musicians of the Rogaland fiddle tradition of today. Besides teaching a variety of tunes, Geitungen will also teach arrangements. This workshop is for all melodic instruments, and percussive and harmonic instruments are welcome to join the fun. The teachers will be playing hardanger fiddle, fiddle, guitar, mandolin, and melodeon. You must be able to learn and play melodies by ear, but Geitungen will provide sheet music (just in case....). 10 am to 3 pm – Finnish Polka Phrasing and Music Style on Accordion with Teija Niku of the Polka Chicks . . . Teija Niku started performing with her accordion when she was seven years old. She won first prize in the Finnish 2-Row Accordion Folk Championship in 1996 and 1998, and graduated from the Sibelius-Academy Folk Music Department in 2009. Long before she started to play the accordion as a child, she learned to dance the Finnish polka, which shows in her firm style of playing this particular dance. In her workshop, Teija will reveal some secrets of a great Finnish polka groove, both on a 2-row (G-C) and a 5-row. 1 pm to 3 pm – Bouzouki/Guitar Accompaniment with Jens Ulvsand of FAERD . . . Jens Ulvsand, Swedish guitar, bouzouki player and singer, has been an integral part of the Swedish folk music scene for the past 15 years. Jens is a member of the internationally known Avadå Band, the Danish/Swedish Project and Trio Mio. Besides his work as a touring musician, he is a highly respected teacher at the Music Academies in Malmø, Sweden and Odense, Denmark. 10 am to 3 pm – Swedish Singing with Josefina Östling . . . Josefina studied folk music at the Malung Folk School and the Music Conservatory in Falun, Sweden. She learned musical technique and singing from some of Sweden's most renowned folk musicians, including Maria Röjås, Sofia Sandén and Björn Ståbi. Her repertoire includes hundreds of songs -- from dancing tunes to powerful hymns -- and, of course, the special "herding music" of Sweden, kulning. She has been an active performer for 15 years as both a soloist and in various groups, singing in churches, at spelmansstämmor (festivals) and for dancing. Josefina will teach songs from different areas of Sweden, some with lyrics and others for dance accompaniment. In Sweden, this style of singing for dancing is called trallare. Listen to her sing two tunes: Kvällen Stundar / Lördagskvällen. Participants are encouraged to bring recording devices. 1 pm to 3 pm - Telespringar/Gangar with Loretta Kelley, Carol Sersland, and Bruce Bostrom . . . Loretta will play hardingfele for dance instructors Carol and Bruce in this fun workshop. Telespringar and telegangar are graceful, playful couple dances from Telemark, Norway with improvisatory elements. No previous dance experience is required. Flirt with your partner, feel the sympathetic vibrations of the mysterious Hardanger fiddle, and let the music move you so that you are "dancing on the tip of the fiddler's bow"! Here is an example of the dance on YouTube. Participants are encouraged to have smooth soled shoes and some previous dance experience. Take a look at some shots from the 2004 workshops with the Järvelä family of Kaustinen, Finland, > 2004 workshops.